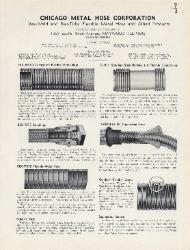 1939 Chicago Metal Hose Corp.
flexibility and extra sturdy construction. Conforms to U.S.
etc.-High quality flexible conduit for numerous applications. Unpacked, cotton cord packed, asbestos packed."